Introduction: The Temperate Broadleaf Deciduous Forest (TBDF)–especially in eastern North America, where is remains most intact–is known for the turning of the colors of its leaves to brilliant reds, oranges, and golds in autumn. The shortening days of fall stimulate the plants to withdraw chlorophyll from their leaves, allowing a brief but beautiful display of other pigments before the leaves are shed completely and plants enter an extended period of dormancy. Climate: Associated with warmer continental and humid subtropical climates (Dfa, Cfa, and–in Europe, Cfb). There is an approximately 6 month growing season. 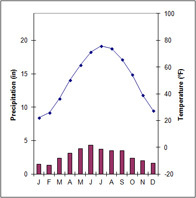 The 20 to 60 inches of precipitation is distributed evenly throughout the year. 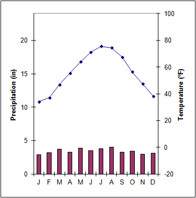 The non-growing season is due to temperature-induced drought during the cold winters. Vegetation: Many of the same genera, previously part of an Arcto-Tertiary Geoflora, are common to all three of the disjunct northern hemisphere expressions of this biome. Included among these genera are Quercus (oak), Acer (maple), Fagus (beech), Castanea (chestnut), Carya (hickory), Ulmus (elm), Tilia (basswood or linden), Juglans (walnut), and Liquidamber (sweet gum). Different species of these genera occur on each continent. a ground layer of lichens, clubmosses, and true mosses. Lichens and mosses also grow on the trunks of trees. Lianas such as wild grape, poison ivy, and Virginia creeper climb the trees to flower and fruit high in the forest canopy. 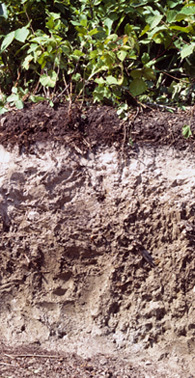 Ultisols replace alfisols in the southeastern US, where the older soils of unglaciated regions have been weathered to a much greater degree and are more completely leached than the younger soils to the north. 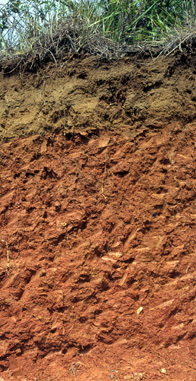 Distinctive red or yellow subsoils have developed under the warmer climate. Ultisols are generally less fertile than alfisols and in the southeast were frequently further degraded under plantation and subsistence agriculture in both the colonial and post-colonial periods. Subclimaxes: On sandy substrates, pines replace broadleaf species. Hence the New Jersey pine barrens, the pineywoods of the Deep South, and the tall (long-needled) pines of Georgia and other areas of the Atlantic Coastal Plain. On waterlogged sites in more northerly latitudes, bogs develop. In the south one finds instead pine savannas and bald cypress swamps. Fauna: Characteristic members of the fauna are either mast-eaters (nut and acorn feeders) or omnivores. Mammals show adaptations to an arboreal life; a few hibernate during the winter months. North American herbivores include white-tail deer, gray squirrel, and chipmunk. Omnivores include raccoon, opossum, skunk, and black bear. Carnivores have been largely eliminated through the deliberate effort of humans but should include timber wolves, mountain lions, and bobcats. The coyote, native to the western grasslands and deserts, has recently dispersed east and taken over the niche of its departed cousin, the timber wolf. Resident bird species also tend to be seed-eaters or omnivores. Many, like the several species of woodpeckers and the chickadees, are cavity-nesters. The loud, conspicuous blue jay is a major agent in the dispersal of oaks onto abandoned farmland and pastures. Migratory species tend to be insectivorous and include many so-called neotropical migrants, including warblers, wrens, thrushes, tanagers, and hummingbirds. Distribution: The TBDF occurs in three major, disjunct expressions in western and central Europe; eastern Asia, including Korea and Japan; and eastern North America. In Europe, a species-poor forest reflects widespread extinctions during the Pleistocene. Oaks, beeches, and elms dominate. Most of the forest was cleared for agriculture, with remnants surviving only in some royal hunting preserves. The TBDF of China is known primarily from the fossil record; intensive agriculture has caused this region to be cleared of natural vegetation for at least 4,000 years. Japan has a largely artificial forest, but in the mountains of Korea the forest is more or less intact and fall foliage is reminiscent of New England’s. Almost all the forests of eastern North America are second growth, but they preserve the world’s greatest diversity of TBDF flora and fauna. This is especially true of the unglaciated Appalachian Plateau of eastern Kentucky and Tennessee and western North Carolina and Virginia. The Great Smoky Mountains have been designated a world biosphere reserve. Southern hemisphere expressions of the biome: Regions of humid subtropical climate occur in the southern hemisphere, but their vegetation and flora differ. Such regions have a mixed (broadleaf and needleleaf) evergreen forest whose biogeographic interest stems from the occurrence of Gondwanan relicts: Araucaria pines (South America and Australia), Podocarpus pines (South America, Africa, and Australia), and the evergreen southern beech Nothofagus (South America, Australia, and New Zealand).